A nice little appetizer that can make it through an evening, a ball game or what have you. They are easy to make and not really expensive. They are addicting though and always a favorite. You can make these weeks ahead of time and freeze them for a quick appetizer or a snack at game time. They are nice to have on hand for a quick no-hassle treat. 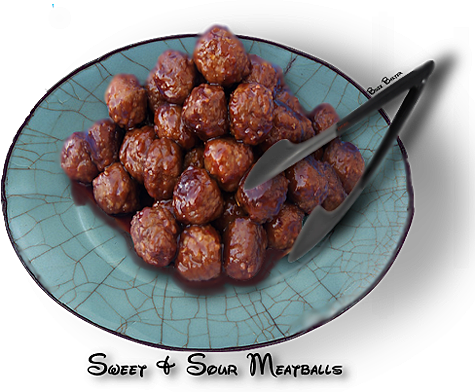 meatballs; keep warm. Pour fat from skillet. 2. Mix cornstarch and sugar. Stir in reserved pineapple syrup, vinegar and soy sauce until smooth. and stir 1 minute. Add meatballs, pineapple tidbits and green pepper; heat through.